Abstract - Post completion error is the kind of human error which occurs when the main task is completed and there is a known (but not vital) final step which has to be done and that is forgotten or not performed. This paper aims to add to the research being done by conducting experiments imitating the real life door to door sales scenario, where salesmen use electronic devices to sign customers up to contract. The study aimed to examine the effect of a static cue button and a warning message and to find an answer to the hypothesis, “A Post Completion Warning message is more effective than a static cue button to reduce the Post Completion Errors.” The experiment has three versions, version 1 being conducted using the simple prototype without a cue and warning, version 2 being conducted using the prototype having a cue, and version 3 being conducted using the prototype having a post completion warning message. The results from the experiment showed that a static cue button is useful to reduce human post completion errors; however, a post completion warning message is much more effective than static cue button in reducing post completion errors. Abstract - ISP-servers system usually consist of many computers is strongly configured, and every computer often assumes a special function. This system often have some problems which are if one of servers has any breakdown, network services running on this server will not run, and some of servers which undertake important network services will run over load while others are still having many resources (i.e., CPU, memory etc), but cannot share. Load balancing program for network services is a new load balancing program for ISP-servers system. Abstract - Mobile Ad hoc networks (MANET) are a set of wireless devices or nodes that communicate with each other without a central authority or infrastructure controlling the data routing. Routing protocols play a major role in delivery of data packets from source to destination. Optimized Link State Protocol (OLSR), a table driven proactive routing protocol, constantly updates the topology information and routes are readily available. Hello messages are transmitted from a node to seek information about its neighbors and updated in the table. The node assumes that a neighbor is not in the range if the neighboring node fails to respond to the Hello message within the specified hold time. In this paper it is proposed to decrease the control traffic overheads by modifying the existing OLSR routing protocol and traffic shaping based on priority of the packet. Investigations are carried out for multimedia traffic and video streamed traffic. The overall network performance does not degrade and performs well under limited bandwidth conditions. Abstract - The aim of this survey is to investigate channel estimation algorithms with carrier frequency offset in MIMO-OFDM systems. According to this, with investigating the channel estimation method, we will design optimum training courses for these systems and will introduce related comparative methods based on LMS and EM algorithms. On the other hand, the LS and MMSE channel estimation methods are introduced for MIMO-OFDM systems that on this basis pilots were inserted among subcarriers in transmitter with distances emerged of sampling theory then Least Square (LS) method was chosen for initial channel estimation in pilots at receiver. These algorithms use simple reversible and present a suitable estimation of channel. The efficiency of these algorithms can be investigated with simulation and the results of estimation will come to a comparison. Abstract - Compressed Sensing (CS) is a novel approach of reconstructing a sparse signal much below the significant Nyquist rate of sampling. Due to the fact that ECG signals can be well approximated by the few linear combinations of wavelet basis, this work introduces a comparison of the reconstructed 10 ECG signals based on different wavelet families, by evaluating the performance measures as MSE (Mean Square Error), PSNR (Peak Signal To Noise Ratio), PRD (Percentage Root Mean Square Difference) and CoC (Correlation Coefficient). Reconstruction of the ECG signal is a linear optimization process which consider the sparsity in the wavelet domain, perceived by the fact that higher the sparsity, more better the recovery. L1 minimization is used as the recovery algorithm. The reconstruction results are comprehensively analyzed for three compression ratios, i.e. 2:1, 4:1 and 6:1. The results indicate that reverse biorthogonal wavelet family can give better results for all CRs compared to other families. Abstract - The radio has been a large-scale development in recent years, with the advent of GSM (Global System for Mobile Communications) mobile phone. 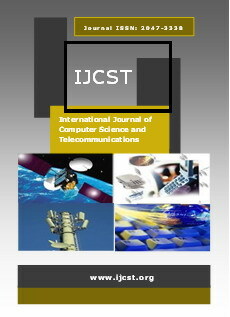 This growth is primarily due to the emergence of internationally accepted standards which facilitated the large-scale deployment, and also control technologies involving telecommunications, electronics and computers. Deploy these networks has been a great challenge for operators who have to master radio waves to completely new applications in relation to what was done since the beginning of the century. We went from broadcasting, personalized information and requirements for quality of service. On both issues, operators have made enormous progress in research on methods and planning tools that incorporate such models radio wave propagation, models for estimating quality of service and optimization algorithms on the setting. Abstract - Secure message communication techniques, based on Spread Spectrum modulation (or message encryption scheme), use a spreading code (or an encryption key) for message security. The commonly used spreading codes or encryption keys are based on m-sequences and Gold codes. Gold sequences are preferred for many applications owing to their data hiding capabilities. The conventional techniques used for the generation of Gold codes use fixed feedback tapings and therefore can prove, sometimes, easy for a hacker to decode or jam the original information signal. A novel circuit for the generation of a Gold code sequences, wherein the feedback tapings change pseudo-randomly, is presented in this paper. The proposed system has been implemented with reduced hardware by using multiplexing process. The experimental results obtained are found to be in step with the theoretical ones. Abstract - While dealing with internet users in the setup of two operators the relationship between traffic sharing and blocking probability is examined by many authors using Markov chain model. Assuming dial-up-setup of connection network and introduction of rest state the mathematical relationship has been modified. This relationship contains many input parameters of the model with special reference to rest state parameter. This paper presents a much simplified form of relationship between blocking probability and traffic sharing under rest state. Because of variation of model parameter there is always an expected change in the equation of straight line. All these changes are average out to get best average linear relationship between traffic sharing and blocking probability. This one is useful for immediate computations of traffic sharing levels when input has variant values. Abstract - The growing number of ontologies on the web has emerged new research issues in the field of semantic web. It is now common to have more than one ontologies on the web for a specific domain. These ontologies may have various types of heterogeneities and therefore it is a challenging task for information retrieval systems to utilize the knowledge of all available ontologies. A number of ontology alignment systems have proposed by researchers in the last decade to bridge this semantic gap. During an alignment process, the entities from different ontologies are compared to find the semantically similar entities. For this purpose, various similarity measures are discussed according to the type of ontological heterogeneities. This paper investigates most common types of heterogeneities exist in ontologies and matchers which can deal with such heterogeneities. Furthermore, the role of aggregation methods in alignment systems have also been analyzed and discussed. Abstract - TCP becomes inefficient when the Bandwidth of the network and delay increases, because slow loss-recovery, a RTT bias inherent in its AIMD congestion-control algorithm, and the bursting data flow caused by its window control. To overcome this problem an application-level is built on top of UDP, called UDP based data Transfer Protocol, or UDT. UDT protocol contains the protocol design and its own congestion control algorithm which is also a framework for configuring new congestion control algorithm. UDT is a high performance data transport protocol, which is mainly, designed for bulk data transfer over high speed wide area networks. It is extended with Configurable Congestion Control to new enhanced versions called UDT/CCC, which supports a wide variety of control algorithms, including TCP algorithms. It is a configurable or reusable user space network stack on which a new congestion control algorithm can be easily implemented, deployed and evaluated. In this paper the potential of the UDT/CCC framework is analyzed by implementing the new control algorithms which is inherited from the CCC. Two types of control algorithm are implemented which is of type Rate based and Window based, after implementing the performances are to be obtained. Abstract - Video object segmentation is an important part of real time surveillance system. For any video segmentation algorithm to be suitable in real time, must require less computational load. This paper addresses the problem of maintaining the background with the changes in the scene. The algorithm proposed in this paper enables to update the background image timely without compromising the time taken for object detection by executing the algorithm in parallel with the object detection process. Background maintenance is done by evaluating the probability of occurrence of the intensity value at each pixel coordinate. Algorithm has been implemented on videos with various changes in the scene in which the results are quite encouraging. Results obtained with the proposed algorithm are compared with the traditional background subtraction method. Abstract - An extremely significant and compulsory concern for Mobile Ad hoc Networks is to find the cause among Source and destinations, which is a most important technological dispute due to Dynamic Topology of the Network. Routing Protocols for MANETS may possibly be different depending on applications and Network Architecture. The effectiveness of the Wireless link can be enhancing by Multicasting all the way through transferring solitary replica of messages to all the members of the group. Multicasting communication is a very efficient method while contrast to Unicasting in sustaining grouping communications applications and therefore is a significant feature of future Network progress. There are different Routing Protocols that have been projected for MANETS; it is impossible to cover up each and every Protocol in this Survey. In this Survey, we explain usual Routing Protocols found on Unicast or Multicasting routing schemes on Mobile Ad hoc Network Routing, a further criterion for organizing the Routing Protocols for Mobile Ad-hoc Networks, i.e., Proactive, Reactive and Hybrid approaches have been used in every of Unicast Routing Protocols and Multicasting Routing Protocols. Abstract - This paper proposes a novel technique for iris recognition in the context of biometric identification of a person. The iris is a portion of the inner eye of an individual and contains an abstract and randomly generated texture pattern arising from orientation of complex tissues within this region. This random pattern can provide a unique identifier of a person if a mathematical model can be built to represent and compare it. In this paper the iris images are mapped to Eigen-space and a robust iris code signature is generated from different camera snapshots of the same eye to incorporate tonal and lighting variations. To enable real-time identification the signature is represented as a low dimensional feature for reducing computational overheads. It is observed to produce high recognition accuracies which highlight the reliability of the feature. Moreover the technique is seen to be robust which can work satisfactorily with noisy and partially occluded images. Abstract - Mobile Ad hoc Networks have special properties and one of the most significant of those properties is nodes mobility which in part plays a considerable role in network’s different parameters. Many efforts were made to make an infrastructure for these networks. In these infrastructures or clusters, a main node called clusterhead has a vital role in keeping the structure, routing and enhancing the efficiency of the network. In this article, an innovative clustering algorithm in mobile ad hoc networks is presented which has emphasis on a parameter that represents the convergence of the cluster with predict mobility. In this method, three parameters ,Relative speed, Ndm and battery power are used to calculate the primary weight of nodes, then a convergence coefficient can be achieved using the strenght of received signals of neighbors and predicting the nodes mobility . This value will be multiplied to the primary weight of the nodes afterwards, so that the final weight can be computed. In simulation, the proposed algorithm has been compared with WCA, MOBIC and the Lowest_ID algorithm. The results of simulation reveal that the proposed algorithm achieves the goals. Abstract - Wireless mesh networks (WMNs) have emerged as a key technology for next-generation wireless networking. This paper focuses on a variety of routing protocols that are used in wireless mesh networks and identify the performance of these routing protocols. The performance is done with regards to load balancing, packet delivery ratio, congestion, network overhead, throughput and mobility of nodes. Abstract - Security evaluation of a system is a complicated problem. The majority of the recent efforts in Security evaluation involve for discovering well-known Vulnerabilities. Discovering unidentified Vulnerabilities yet mostly remains a subjective procedure. The procedure knows how to be improved by considering the Characteristics and behavior of well-known Vulnerabilities. The information therefore obtained knows how to be planned into an appropriate Taxonomy, and then can be used as a structure for systematically and investigating new Systems for related however at the same time as yet unidentified Vulnerabilities. There have been several efforts at producing such Taxonomies. This paper offers a detailed review of the significant work done on developing Taxonomies of Attacks and Vulnerabilities in Computer Systems. This review covers work done in security related taxonomies. Apart from giving a state of the art review of Taxonomies, furthermore we examine their efficiency for use in a security evaluation procedure. In conclusion, we sum up the significant characteristics of various taxonomies to provide a structure for organizing information about well-known attacks and vulnerabilities into a taxonomy that would help the security evaluation procedure. Abstract - Software usability became an important quality factor in recent years due to the increasing demand of interactive software systems. Now mostly systems are developing using object-oriented methodology. The object-oriented methodology reduces design complexity, so enhances usability. Also object-oriented approach improves the usability of software system when software engineering process combined with usability engineering. This paper proposes an extended ISO-9241 usability model. Since fuzzy modeling approach deals with uncertainty and impreciseness involved in usability and its sub-factors, this paper investigate the application of fuzzy AHP technique to ISO-9241 model and the proposed enhanced ISO-9241 model. The result shows better usability of proposed model in comparison of existing model. Abstract - CORDIC is an acronym for COordinate Rotation Digital Computer. It is a hardware-efficient, shift and add algorithm that is used in various digital signal processing applications for computing trigonometric, logarithmic, hyperbolic and other linear and transcendental functions. Traditionally the algorithm is implemented in hardware in two different styles: folded and unfolded. Unfolded structures are pipelined to increase the throughput of the structure. This paper implements the algorithm in normal unfolded style, but using multistage pipelined adders. The resulting structure is compared against the traditional unfolded and pipelined approaches and is shown to have an improved throughput. The structure has been coded in VHDL and implemented using Xilinx FPGA synthesis tool. The algorithm has been simulated for sine and cosine function evaluation. The simulations are carried out using Xilinx ISim tool. Abstract - This paper presents a survey and overview on Distributed Hash Table, its implementation, Applications and Security techniques. This paper presented on the literature for dealing with Security concerns associated to malevolent Nodes in structured Peer-to-Peer Networks, furthermore identified as Distributed Hash Tables. We explain achievable resistance and protection against several distinguished Attacks and analysis their advantages and disadvantages in the form of tables. We also verify how complicated it is to protect such type of a System in an unfavorable situations, as we were incapable to find a System capable to survive all the present and studied Attacks. Jeevanandam Jotheeswaran, Loganathan R. and Madhu Sudhanan B.
Abstract - Opinions express viewpoints of users, and reviews gives information about how a product is perceived. Online reviews are now popularly used for judging quality of product or service and influence decision making of the users while selecting a product or service. Opinions are increasingly available in form of reviews and feedback at websites, blogs, and microblogs which influences future customers. As it is not feasible to manually handle the huge amount of opinions generated online, Opinion mining uses automatic processes for extracting reviews and discriminate relevant information with sentiment orientation. In this paper, it is proposed to extract the feature set from movie reviews. Inverse document frequency is computed and the feature set is reduced using Principal Component Analysis. The effectiveness of the pre-processing is evaluated using Naive Bayes and Linear Vector Quantization. Abstract - Grid computing is a wide area parallel distributed computing environment where idle processor cycles and underutilized storages of geographically dispersed resources are utilized optimum way which act as a supercomputer. In this paper we identify and explain the problematic key security issues and propose briefly some novel approaches for solving those existing security related problems lie in Grid computing environment. Md. Sanaullah Baig, Rajasekar M. and Balaji P.
Abstract - Enterprise Resource Planning (ERP) software presents a frame for organizations to better utilize their process and business. Early generation of ERP systems utterly focused on infrastructure renewal and creating efficiencies in back office operations around key functional areas such as finance and production management. These systems, while useful, did not address the mission critical issues such as supply chain management (SCM), customer relationship management (CRM), and knowledge management (KM). New generation systems have sought to address these short-comings in a variety of ways. Implementation of ERP software is the process of adaptation of the frame to the organization. Therefore, implementation process should be good managed in order to achieve the targeted results of ERP philosophy. To facilitate these implementation projects, ERP software should be supple enough to meet extra data requirements of implementation domain. In this paper, a case study is constructed to denote implementation problems arisen from inflexible design.